Fraxel Dual laser treatment is one of the exciting and effective treatments offered by Dr. Gary Goldenberg in his New York practice. Fraxel Dual can be used to treat a variety of skin complaints, including discolorations, brown spots, acne scars, and wrinkles. If you suffer from any of these skin problems, make an appointment with Dr. Goldenberg to see how Fraxel Dual can help you achieve the appearance you desire. Fraxel Dual is one of the most effective laser treatments available today. The laser essentially works to reduce or completely eliminate blemishes on the skin’s surface, while improving the overall tone and texture of the underlying skin. Fraxel Dual works with your body to stimulate a natural healing process that will quickly reveal skin that is rejuvenated and free of blemishes. The introduction of this technology has made skin resurfacing a much more approachable treatment, and has quickly made Fraxel Dual one of the leading laser treatments for discolorations, wrinkles, and other common complaints. Fraxel Dual belongs to a group of laser treatments that are known as “non-ablative,” which means that they do not create open wounds on the skin. Fraxel Dual treatments are able to provide the same level of effective treatment as older ablative lasers, but with far less downtime and discomfort. 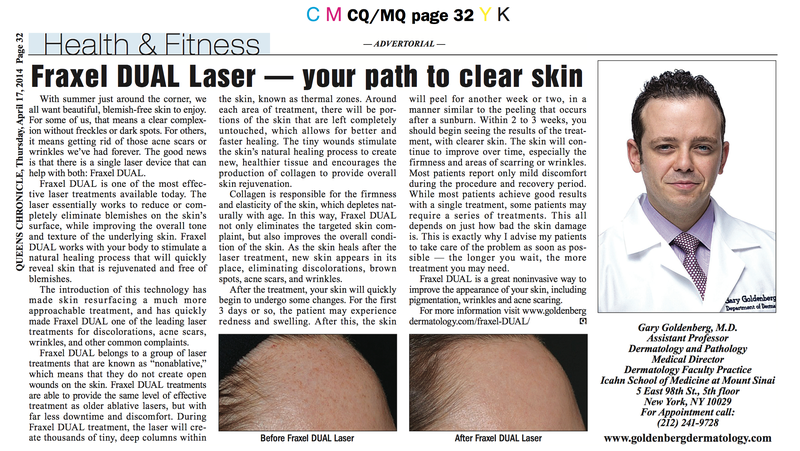 During Fraxel Dual treatment, Dr. Goldenberg will pass the laser device over the targeted skin area. The laser will create thousand of tiny, deep columns within the skin. Around each area of trauma, there will be portions of the skin that are left completely untouched, which allows for better and faster healing. The tiny wounds stimulate the skin’s natural healing process to create new, healthier tissue and encourages the production of collagen to provide overall skin rejuvenation. Collagen is the protein responsible for the firmness and elasticity of the skin, which depletes naturally with age. In this way, Fraxel Dual not only eliminates the targeted skin complaint, but also improves the overall condition of the skin. As the skin heals after the laser treatment, new skin appears in its place, eliminating discolorations, brown spots, acne scars, and even wrinkles. After the treatment, your skin will quickly begin to undergo some changes. For the first 2 or 3 days, you may experience redness and swelling. After this, your skin will peel for another couple of days, in a manner similar to the peeling that occurs after a sunburn. Within a week, you should begin seeing the results of the treatment and feel comfortable being in public. You will need to follow your doctor’s instructions carefully – you may be required to apply an ointment to the treatment area and avoid direct sunlight for some time. Most patients report only mild discomfort during the procedure and recovery period. Depending on the cosmetic issue being addresses, you may need to undergo a few sessions of Fraxel Dual laser treatment. Dr. Goldenberg will be able to advise you on the number of treatments that will be required after he examines your skin and discusses your medical history. With an office in NYC, Dr. Goldenberg prides himself on offering the safest and most effective technologies available today. To learn more about how Fraxel Dual can help restore and improve the appearance of your skin, make an appointment with Dr. Goldenberg today. How to treat pitted scarring from acne? Fraxel Dual, of course!